A little late but here is the first half of our Cambodia trip. People have been living in the area of Cambodia for over 7000 years and the Khmer Empire had its golden age in the 9th to the 13th centuries, when among some of the world’s largest and most ornate temple complexes were built there, most notably Angkor Wat. In the 19th century it became part of French Indochina when some of these treasures were rediscovered deep in the jungle which had swallowed them as the fortunes of the country declined over the centuries in numerous conflicts with its neighbours. 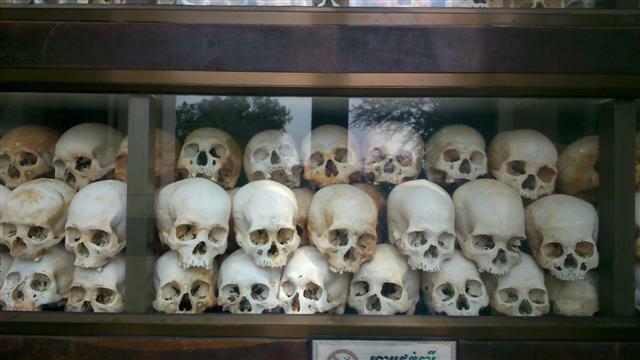 The Vietnam War extended into Cambodia, giving rise to the Khmer Rouge lead by the fanatical communist Pol Pot. When American forces withdrew he was able to seize power in a brutal bid to establish a peasant utopia. While attempting this he comitted the Cambodian Genocide, which lasted from 1975 to 1979 and caused the deaths of at least 1.5 million Cambodians. 1 in 5 of the population. Just as horrific was that, though this monster was deposed by a Vietnamese invasion in ’79, he was still recognised as a legitimate leader by the UN over a decade later and trials for war crimes did not even start until well into the next millennium. By this time he had lived a full life, had enjoyed his grandchildren and had died in his eighties. The good people of France, Britain and America, to their shame, had stood by while evil quietly triumphed. After years of isolation the war-ravaged nation was reunited in 1993 under the monarchy and her phlegmatic but friendly people are working hard to earn tourist dollars to help rebuild their land. Visiting the Killing Fields at Choeung Ek, one of more than 300 extermination camps, half an hour southwest west along a dusty road out of Phnom Penh is a very moving experience and not for the feint of heart. 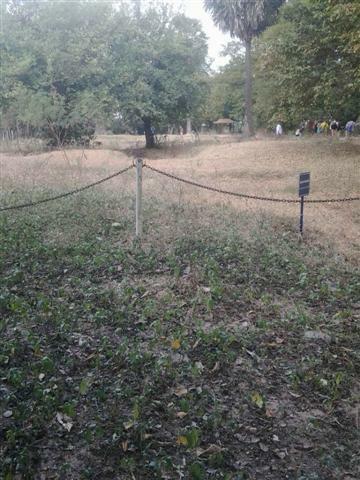 The audio-phone presentation treats the matter with great sensitivity as it describes the history of this place and walks you in the footsteps of the condemned to depressions in the ground which mark the perimeter of mass graves. Here insanity was visited on upwards of 9000 souls not with gas or gun but with knife and bludgeon. For every one the victims whose haunting empty eyes gaze sightess through the glass casements of the central monument there were a thousand more who perished miserably in the fields under the brutal forced labour of a false ethos. Cambodia’s wish is that their loss should stand for the world to see and, so doing, hope to prevent it happening again. Futile perhaps, as the human catastrophes continue in the Middle East and Africa let alone what’s happening behind the closed doors of North Korea, but a worthy sentiment nonetheless. 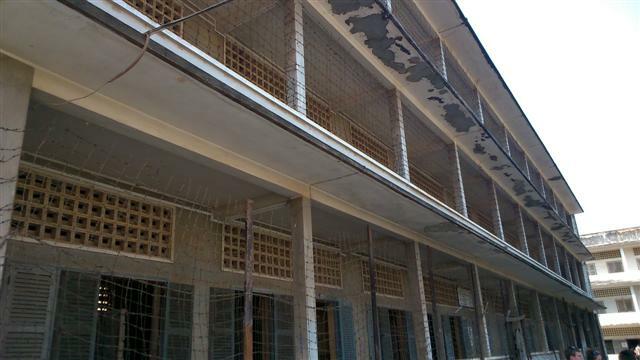 S21 the Toul Sleng Genocide Museum, at one time a secondary school, lies back in the city. 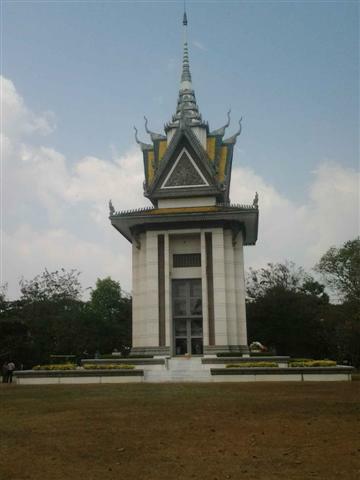 This was a prison for political prisoners and their families where confessions were tortured out of the victims before they were taken to the Killing Fields. The process was meticulously recorded and includes walls full of dark and disturbing photos of the dazed and frightened arrivals to this hell. A harrowing museum but one which at least has the merit of providing much evidence and incentive to peruse the criminals. 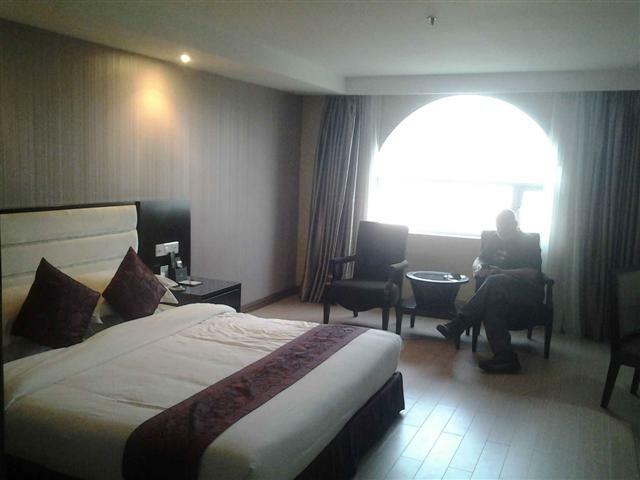 This had been an emotionally exhausting day so we were pleased to return to The Landscape Hotel overlooking the river and shower the dust of the road from our bodies. We ate quietly that evening at a small Nepalese restaurant up a side street from the hotel which served the best food of our whole trip washed down with a large jug of beer for about £5 each. 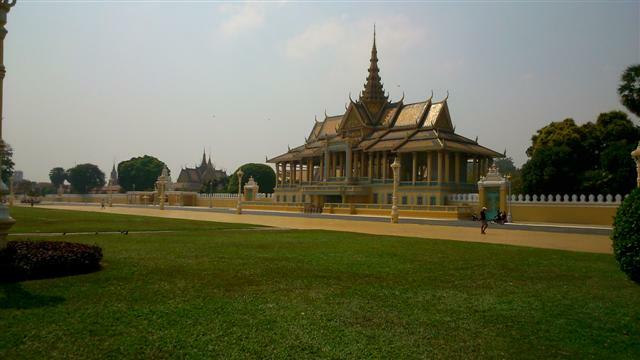 The Royal Palace sits in a large compound about 10 minutes walk from the hotel. 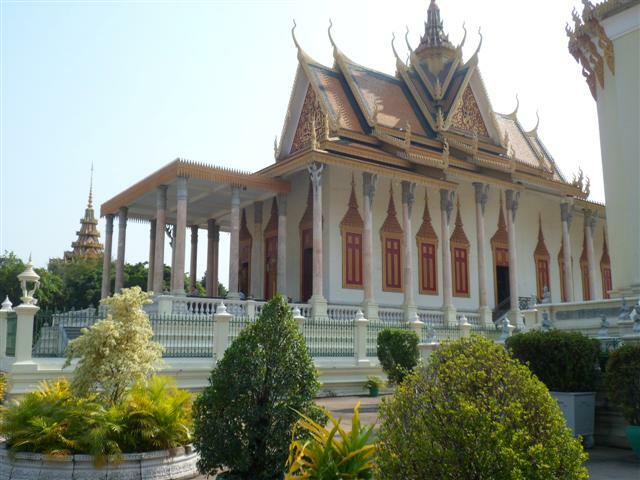 It is a complex of superb ornate buildings which serves as the royal residence of the king of Cambodia and was first occupied by Royalty in the 1860’s when it was built for that purpose. 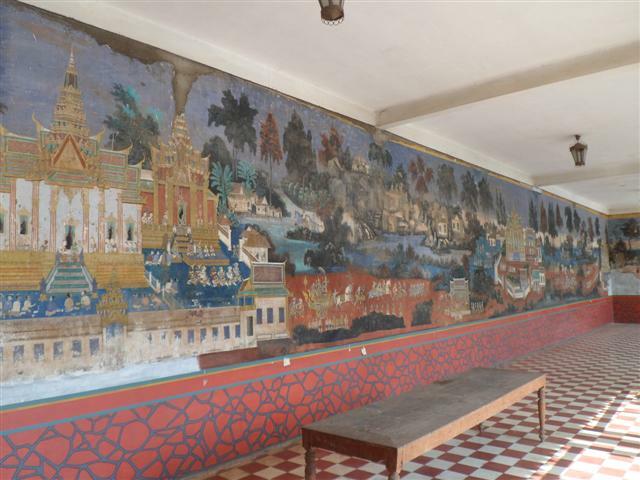 It has cool shady cloisters around the silver pagoda with an amazingly detailed mural on the inner wall which is currently being carefully restored. 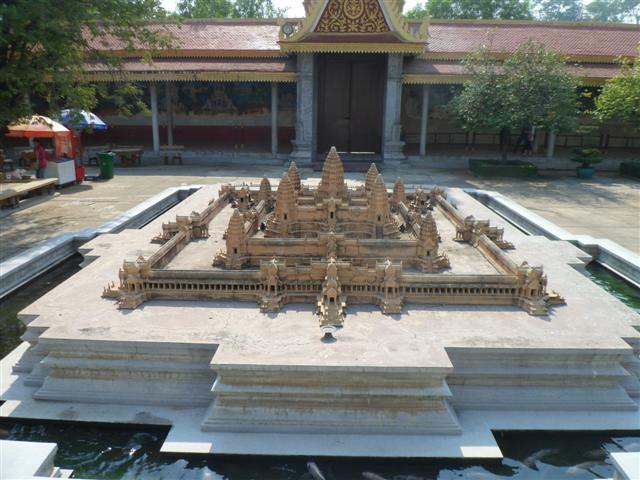 In the same area there is also a scale model of Angkor Wat. As I looked over the epic scale of the model, our next destination, started to dawn on me. We both could not wait to get on the bus and head on to Siem Reap, the largest town in the province and also our rendezvous with our son James who had been travelling in Vietnam since we were in Laos. 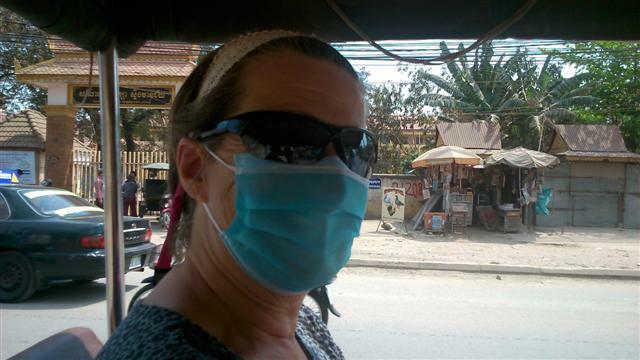 To say that the coach headed down the road to Siem Reap is to overstate the condition of the ground we travelled over. It took 7 hours of jouncing in and out of potholes, swerving around half finished bridge foundations and I’m certain that the driver was a mate of that looney in Laos. In a couple of years, when they have finished the widening it’ll be great but for now it was pretty uncomfortable. So our next adventure was to visit Angkor wat. Posted on February 4, 2014, in Uncategorized. Bookmark the permalink. Leave a comment.